When hes not behind the decks at Berlin institutions Panorama Bar, Watergate, Weekend, Tresor and the like, Berlin frequenter Markus Ferdinand (aka M.in) can be found in the studio cooking up releases & remixes for labels the likes of Desolat, Get Physical, Kling Klong, Defected, Supernature, Cecille, Robsoul, KD Music, and more. On top of this he still finds time to run My Favourite Freaks Music and My Favourite Freaks Booking, showcasing artists at the cutting edge of todays tech-house & techno scene. 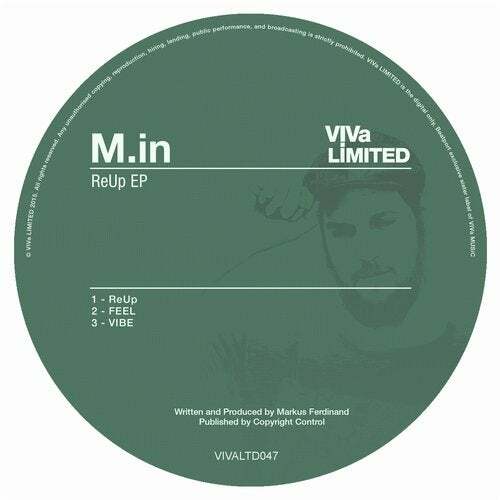 We are very proud to present M.ins debut on VIVa LIMITED, a 3 track EP including; ReUp, Feel and Vibe. Each showcasing a different flavour of his distinct style of minimal tech-house that has earned him widespread industry recognition. Previous releases from M.in have earned support from; Steve Lawler, Sven Väth, Marco Carola, Loco Dice, Davide Squillace, Matthias Tanzmann, Joris Voorn, Nic Fanciulli, Riva Starr, Radio Slave, Monika Kruse, Kaiserdisco, Reboot, Robert Dietz, Nick Curly, Tiefschwarz, DJ T., Thomas Schumacher, Audiofly.